Special History in the News Update: What’s Happening to Egyptian Treasures? With the internet down and Twitter blocked, we had to rely on second hand reports from friends of friends or relatives in Egypt with land lines. Western papers speculated on rumors. Al Jazeera posted a series of scary photos on Flickr showing damaged items from the Cairo Museum. I’m sure visions of the criminal looting of the Baghdad Museum in Iraq, while U.S. troops guarded the Oil Ministry, flashed through more than one person’s mind. The world has witnessed an unprecedented popular action in the streets of Egypt, led by Egypt’s youth with their justified demands for more freedom, more democracy, lower prices for necessities and more employment opportunities…Events deteriorated as lawless bands of thugs, and maybe agents provocateurs, appeared and looting began. The young people organized themselves into groups that directed traffic, protected neighborhoods and guarded public buildings of value such as the Egyptian Museum and the Library of Alexandria. They are collaborating with the army…The library is safe thanks to Egypt’s youth, whether they be the staff of the Library or the representatives of the demonstrators, who are joining us in guarding the building from potential vandals and looters. Today is a new day, but there are still marches in the streets of Cairo. I am personally very sad for my country. I cannot believe the devastation that has happened in the streets, and that so much has stopped in the last 11 days. We have lost so much, and I do not understand how this could be. It is like a dream for me. I have come into this new position at a very critical time, but the most important thing about this is that for the first time in history Egypt has a Ministry of Antiquities. …As I have already stated, nothing was stolen from the museum; 70 objects were damaged but can be restored. Unfortunately, we cannot restore them now, as we had hoped, because the museum is closed and surrounded by the commanders of the army. The curators are stationed in the control room, and the cameras in the control room can see outside and inside of the museum. …Yesterday, I received a report from Mohamed Abdel Maksoud, the general director of Lower Egypt, that 288 objects stolen from the storage magazine in Qantara East in the Sinai have been returned. 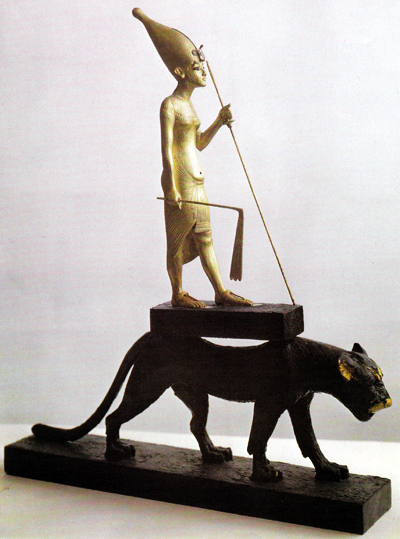 He also confirmed that these objects and statues constitute everything that was taken. …I hope that my reports will help you all to feel calm. Each of of my daily reports have been posted on my website, drhawass.com, and the SCA website, http://www.sca-egypt.org/eng/MR_PR.htm. You all know me, if anything happens I will report it right away. Again, and again, and again I tell you that the monuments of Egypt are safe. Updated: Dr. Hawass posted on February 12 that after an inventory, they have discovered several items missing from the museum and another magazine has been broken into. An investigation has begun to search for the people who have taken these objects, and the police and army plan to follow up with the criminals already in custody. I have said if the Egyptian Museum is safe, than Egypt is safe. However, I am now concerned Egypt is not safe…In another terrible turn of events, last night a magazine in Dahshur was broken into; it is called De Morgan’s. This magazine contains large blocks and small artifacts. thanks for such an inspiring story, Faith. Working on the news end for my day job, all we report is bad news, death, rioting, and bloodshed. Your article givess me hope that humanity is still part of what makes us human – no matter where we live, even under dire circumstances. We all believe Egypt Is Safe will be safe.